Doing laundry is quite a process, from gathering dirty clothes, towels and linens, sorting, washing, drying, folding and then starting the whole cycle over again! Wash clothing - typically this is done in your washing machine, but certain items may need to be hand washed. It is important to choose the right cycle for washing, and also the right water temperature, which depends on the fabric, stains, and other variables. Dry clothing - Obviously, after washing clothes the items will be wet and need to be dried. If you dry them in the dryer, you must choose the right temperature and setting. In addition, you can also line dry or lay clothes out to air dry. Folding Clothes - Once your clothes are dry they need to be folded back up to be used again (or hung up on hangers). There are some rules for folding which can make the process easier, faster, and also keep your clothes from getting as wrinkled. To do your washing properly, and to make all the individual decisions necessary to make sure you get your clothes clean without harming them, you are typically guided by care tags on your clothes. These can be difficult to decipher though, because they generally contain laundry symbols, little pictures which are supposed to convey a lot of information in a small space. Unfortunately, they aren't at all intuitive, and you typically need a chart to reference to help you decipher them properly. I will be gathering resources for you to use to help you quickly and easily understand the instructions on your tags, so you can care for your clothes properly without a lot of headaches. There are a couple of rules for sorting clothing properly, with the main criteria being to sort by color, fabric type, and the dirt or soil on the clothing itself. In fact, there are four questions to ask when sorting, and also a trick for how to get the sorting done more quickly. Further, if you make a mistake and don't sort properly and have a laundry mishap, I've got tips for how to fix bleeding colors. The articles listed below will help you with this step in the process in more detail. When you wash your clothes and other laundry you need to first decide if you'll be hand washing, or using a washing machine. In addition, you'll need to decide what type of detergents and other laundry productsto use on the clothing, and what water temperature to wash everything in. Further, although most clothes, once properly sorted, can be washed in large loads with like items, there are some special rules for how to wash certain unusual items. I'll be discussing all these topics in this section. Presoaking Laundry Stains: Great Technique! After your clothing gets washed, it must be get dried. You can, of course, dry clothes in either a clothes dryer, or dry them in the air either by line drying, or some other method. This section will discuss all types of laundry tips for drying fabric, and rules you need to know to make the process easy, and keep you from ruining clothing during this part of the cycle. This part is generally pretty simple, but actually trips quite a few people up. It can be a lot easier to throw everything back in a laundry basket, out of the dryer, then actually take the time to fold everything. This section will not only give some nitty gritty laundry tips and advice for how to fold various types of clothing and other fabric items, but also tips for how to get motivated to get the folding done in the first place. While you may fold some clothes, you may hang others, and often those that are hung up may need to be ironed. You may even iron some things before folding them, such as linens or sheets. Keeping your clothes, towels and linens clean can be expensive, what with all the detergents and other supplies to purchase, along with paying for resources such as water and electricity that are used in the process. You can explore these frugal laundry ideas and tips you can use to save money while still keeping your clothes clean. Let's face it, washing clothing and other fabrics is basically a never ending process. Even if you've washed all the dirty clothes in the hamper, you and every other member of your household still have the clothes on you're wearing right now, which will soon get thrown into the basket for washing. While keeping up with this process can seem like an impossible task, there are tips and tricks you can use to turn those laundry piles into laundry smiles, by following a tailor made schedule and routine which best suits your life and home. 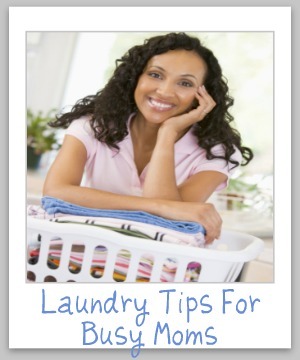 I'm sure there are lots more laundry tips and tricks I haven't shared yet, and there is always more information to learn and cool ideas to discover. If you haven't seen a great tip here already, I would love for you to share it with me now. 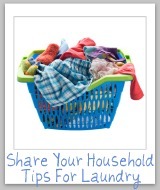 You can share your household tips here. In addition, I love to answer questions too! You can ask me your laundry questions here, or read other questions I've already answered. I'd love for you to keep in touch with me, and I've created a couple offree resources for you when you do! If you subscribe by email to get my weekly newsletter you will get afree laundry stain removal chart! In addition, if you "like" the site on Facebook you'll receive a free 40 page housekeeping checklist e-book. I hope you enjoy these gifts, and stop by again soon!